You probably don’t recognise the person whose portrait this is. 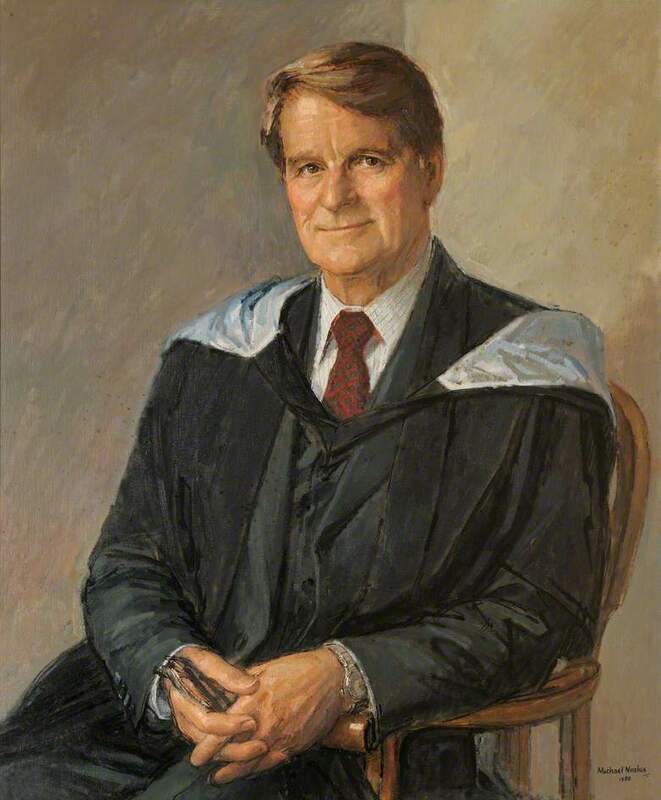 It was painted in 1988 and its subject, James Holt is now over 90 years old. Our paths crossed 40 years ago and I have good cause to remember him. Sometimes help comes unexpectedly when you most need it. When it does you never forget the person who helped you. At 21, I was a hippy – flared trousers, shoulder length hair, the lot. I was at university studying English History. Despite my appearance, I was desperate for a career in the police service and I’d been offered a place on the Police Graduate Entry Scheme. All I needed was to pass my degree. When it came time for Finals, it was all or nothing – no assessed work – it all came down to 10 (3 hour long) written exams in a fortnight. I’d crammed hard and I was as ready as I’d ever be. But the trouble was my handwriting; it had always been shaky and I didn’t know if it would stand up to 30 hours of exams. The first few papers weren’t too bad. I hit the jackpot with a few stock questions and I began to feel more confident about passing. But although I knew what I wanted to say, my handwriting began to crumble. By Paper 7 (Church Architecture in the Middle Ages, as I recall) it had become an illegible scrawl. Even I could hardly read it; the examiners didn’t stand a chance. I knew I’d failed but I carried on anyway – I couldn’t think of anything else to do. After the last exam, I went out with my mates to drown my sorrows. Then I waited for the axe to fall, as I knew it would. Three days later there was a message in my pigeonhole (no mobile phones back then) instructing me to attend the Head of Department’s office at 9.30am the next day. I’d been expecting something like this. Decent of them to tell me in person, I thought. Even so, I couldn’t sleep. At the appointed time, I knocked on the door of the Professor’s study and waited. Professor James Holt was a blunt Yorkshire man who spoke with a slight lisp; a world expert on Magna Carta (I’d taken his seminar); and notorious for not tolerating fools – gladly or otherwise. Flower power and student revolution had passed him by; he wore heavy brown brogues and had leather patches on the elbows of his tweed jacket. All in all, he was not a man to be trifled with! “Come in,” he boomed through the door. I entered his study, my heart pounding. The inner sanctum, the holy of holies: walls lined with gold embossed volumes; mediaeval exchequer records scattered on a vast oak table; student papers and PhD theses waiting to be read, piled in great heaps in front of him on the desk. I stood nervously. I hadn’t been invited to sit down. I had nothing to say (“Tell me something I don’t know,” I thought). He handed me the four illegible exam scripts. I felt so ashamed I actually blushed. I couldn’t believe my luck. The papers got typed. I got my degree (and joined the police). That was the last time I saw Professor Holt although I’ve often thought about what he did for me. Two years ago, I tracked him down – Professor Emeritus Sir James Clarke Holt, Honorary Fellow of Emmanuel College, Cambridge – and wrote him a letter telling him what a difference his generosity had made to my life (to my police career, to further academic study, but above all to my confidence and self-belief). He never replied. He probably couldn’t read my handwriting. Thank you Geoff – I enjoyed reading. I hope one day you’ll write about why you went from English Literature to policing – which seems unusual. Hi Iva. It was mediaeval history. Where else in the 20th century was I going to find a good dungeon to work in? Ah – I should have read more closely. And now I see the transition makes complete sense! hello there. This seems to have cropped up on google now because he died this week. He was my father, and as far as I can remember from 59 years acquaintance, did not have a lisp. I sound a bit like him when I get acerbic like that. However the reason I wanted to make some sort of contact was that he was very frail for the last few years; if you got no reply that was why, and more my fault than his. I ‘ve ben trying to deal with his correspondence for some time. He would have read your letter and enjoyed it, even if it finished up in a heap of assorted papers on the floor. He always liked to feel he had given some sort of help to students, whether they carried on with History or became a copper. Incidentally you weren’t the guy who got hit on the head by a fence post pushed over in a demo at Greenham Common were you ? That’s the only ex-student who went into the police that I was aware of.